Construction has commenced on the University of Melbourne's Melbourne Connect - a pedestrian friendly innovation precinct located on the site of the former Royal Women’s Hospital, and connecting Carlton with the University of Melbourne’s Parkville campus. This follows the demolition of the existing structures on the site and ground works. Developed by the University of Melbourne in partnership with a consortium led by Lendlease, the precinct will provide facilities where university staff and students, researchers, local and international businesses, government and start-up companies are encouraged to connect, collaborate and execute breakthrough new ideas. 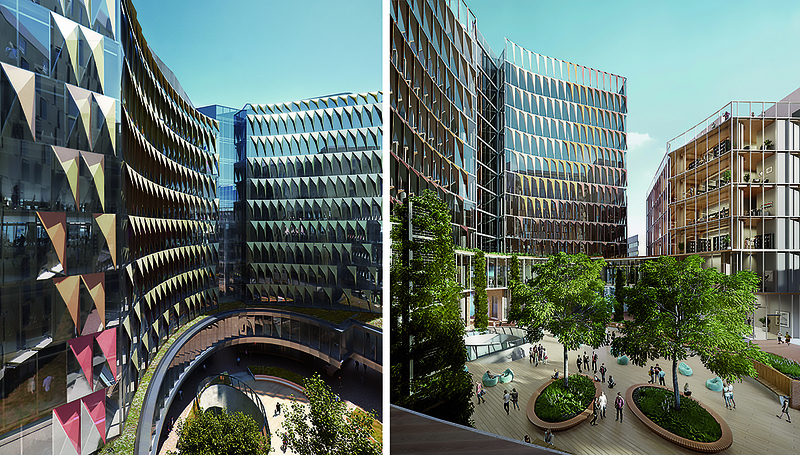 Woods Bagot have designed the precinct in collaboration with Hayball and ASPECT Studios, with the aim of establishing a new benchmark in industry collaboration upon completion in late 2020. The design features a 3,260 sqm ‘Superfloor’ on the mezzanine level which Woods Bagot says "embodies the value of collaboration in a very physical sense." The Superfloor connects the buildings that comprise Melbourne Connect, forming the interior 'heart' of the project and providing a contiguous, physical space for tenant partners and visitors to congregate and exchange ideas. Woods Bagot says it is committed to ensuring the project continues to be an exemplar of design and sustainability, highlighting this as a key driver since the consortium won the design competition in 2016. This intent is expressed in the mass timber structure of the smallest building in the precinct ensemble. According to Woods Bagot, the use of Cross Laminated Timber (CLT) demonstrates the aspirational, future-focussed nature of the project. Designed to be bright and open, the building will play host to pitch nights, hackathons and masterclasses, workshops – providing opportunities to actively engage with government and industry. Childcare facilities will span the upper floors to the rooftop terrace. The lower levels of the CLT building form a centre dedicated to enriching the culture of entrepreneurship within the university and creating the future’s leading entrepreneurs. The precinct will provide public spaces, retail, cafes, accommodation for more than 500 students and visiting academics, a childcare centre, a co-working and commercial office space, a fabrication laboratory and Science Gallery Melbourne, which will deliver cutting-edge exhibitions, events and experiences. The public realm is enhanced by a range of fixed and loose outdoor furniture elements, power outlets and WI-FI to support working and studying outdoors. The ensemble of buildings are arranged around a central and publicly-accessible open space known as the 'Oculus', which has been designed by ASPECT Studio in conjunction with Hayball and Woods Bagot. The Oculus features vertical green “living louvres” that connect with the upper floors of the buildings as part of the visually identifiable ESD features within the precinct. The Oculus is supported by three laneways and a plaza which connect pedestrians and cyclists through to Swanston, Grattan and Cardigan streets. Public urban furniture is dispersed throughput these public spaces and form part of the precinct-wide way finding strategy. ASPECT Studio's design approach for the public realm sought the adaptive reuse of materials from the former Women’s Hospital. This strategy was adopted to provide a visual reference to the history of the site in an innovative and environmentally sustainable manner. 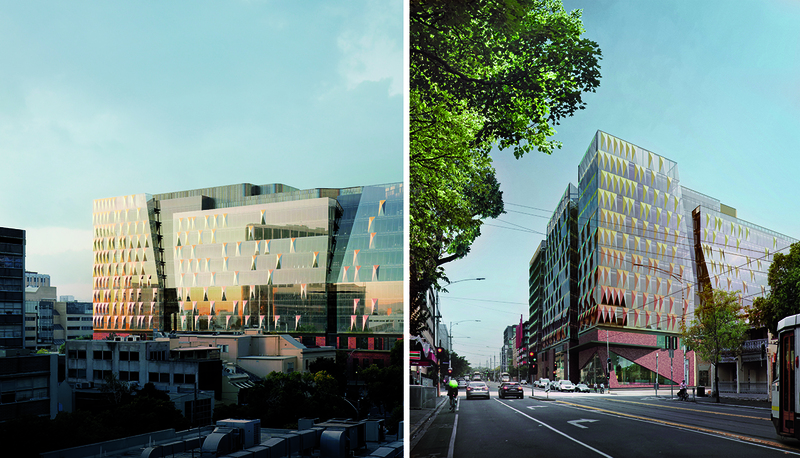 The consortium delivering Melbourne Connect comprises Lendlease as developer, builder, co-investor and investment manager of the commercial space; GIC the major co-investor in the commercial space; Spotless as the facilities manager; and Urbanest as investor and manager of the student accommodation. The Melbourne Entrepreneurial Centre and Science Gallery Melbourne will each be located at Melbourne Connect, with the Melbourne School of Engineering co-located in the precinct. CLT stands out for its sustainability, versatility, strength and aesthetic. Long championed by Lendlease, its benefits translate to safer working environments, improved quality and faster construction time on site due to prefabrication. It’s inspiring to use a technologically innovative product in an equally ground-breaking project. An extension of the workplace for meeting, workshopping, socialising, exhibiting and hosting events, the Superfloor sits at the heart of Melbourne Connect. Taking cues from the central Oculus space below, the interior spaces create an interior ‘landscape’ that allows for serendipitous peer-to-peer meetings and promotes innovation and knowledge exchange for the whole precinct. The Superfloor ensures that visitors can easily and naturally move between a variety of enclosed and open spaces in a way that encourages connection with others via permeability, visual connection and prioritising human comfort. The flexible spaces have been designed in a way that considers how the area will be occupied at different times throughout the year –focussing on how people meet and like to work together. The laneways create moments of curiosity, discovery, warmth, contemplation and occupation for those coming to Carlton Connect. We designed with the pedestrian at the forefront of our mind. Comprehensive site studies of wind and light ensure that the space is welcoming, social and inviting. Carlton Connect is a great example of cutting edge collaborative design where our advice and input as landscape architects is integral to the precinct as a whole. We’re informing a lot of the decisions. Our design for the public realm is responsible to every person using it; not just one user group. We’re thrilled to be involved in this flagship initiative, to develop Australia’s leading innovation precinct to facilitate the connection between researchers, industry, government bodies and community. What’s exciting about this precinct is that it’s not just offering a post-graduate living quarter – it’s a completely integrated, mixed-use offering that combines spaces for industry, research and development, academics, public showcase and community facilities like childcare and retail all in one. Students are part of a world-class academic precinct, a hub where everything is happening on their doorstep. It’s innovation immersion at another level. Hayball is leading the design for the student accommodation offering at the precinct, working in partnership with Urbanest as the developer and operator of this space and as part of the Lendlease-led consortium to develop the precinct. One of the biggest design considerations was ensuring the 527 beds and communal spaces cater to the post-graduate market and visiting academics, while bringing the enthused and active academic culture into the common spaces. Because of this, it was important to create spacious rooms that go above and beyond, homes that are equipped with amenities and offer plenty of breathing space. Likewise, with the communal spaces, there was a strong emphasis on creating a mix of meaningful spaces that are open, welcoming and inclusive to encourage students to mix with others, as well as have opportunity for quiet reflection. Melbourne Connect is a project that will make a significant contribution to the city’s reputation as an international research and innovation leader. The precinct will make a real difference, delivering innovative solutions to major societal challenges. Melbourne Connect brings together university led research, industry and elite thinking in a purpose-built innovation precinct, and demonstrates how the combined expertise of industry and academia can be harnessed to achieve great outcomes.